Prices, Office Hours, New Patient Forms & Contact Us! Acupuncture works by enabling the body to heal itself. It works in a series of treatments and the effects are cumulative. In a sense, an acupuncture treatment 'reminds' the body how to function when it is healthy ~ moving easily & without pain, all of the systems working smoothly and efficiently, emotions are calm, steady, and happy, & sleeping is peaceful. Acupuncture establishes homeostasis, or balance, by reminding the body how everything is 'supposed to work' together; how the systems (endocrine, reproductive, immune, metabolism...) function when they are healthy- without disease and illness, & that pain is an alarm that something else is in need of healing! Acupuncture treats acute & chronic pain, TMJ, sleep issues, anxiety and depression, panic attacks, allergies & asthma, addictions, arthritis & tendinitis, cancer treatment side effects, joint health- shoulders, knees, neck, digestive issues, metabolism & weight issues, insomnia, auto-immune function, hormone balance, erectile dysfunction, fertility, menopause, PMS & gynecological issues – just to name a few! Gentle, effective, and safe treatments take place in a comfortable and professional environment, following a comprehensive consultation and treatment plan customized to meet your goals. Acupuncture is given by a board certified and licensed acupuncture physician, who inserts fine, sterile and disposable needles into specific points on the body to rid pain and symptoms, prevent illness, and promote health. 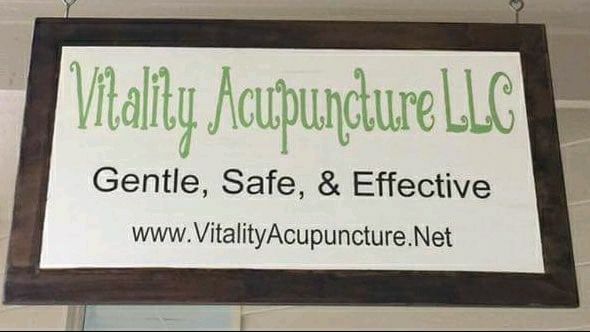 Vitality Acupuncture, LLC, is committed to addressing your needs, communicating with you to prioritize your healing goals, as efficiently as possible & treating the whole person, enabling you to function to the best of your ability! Acupuncture works in a series of treatments, similar to physical therapy, radiation therapy or exercise, & the effects are cumulative – very often long-lasting or permanent. The way Acupuncture works is by triggering the release of the supercharged energy molecule, ATP= adenosine triphosphate, which is made in each of our cells and is present and necessary for ALL of our bodys’ processes and functions to occur. ATP breaks down to adenosine & 2 phosphates, & can convert back again to ATP, depending on what the body needs at the time. Acupuncture is most well known for treating pain. Adenosine is released during acupuncture & has anti-inflammatory effects & mediates all types of pain: acute, chronic, & neuropathic. 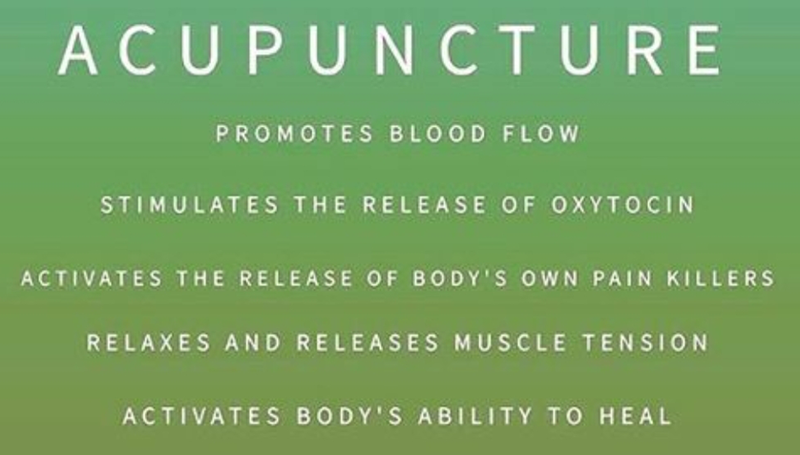 The reason Acupuncture is effective to treat so MANY different conditions, is because ATP & adenosine are present in ALL cells, in ALL body tissues, in ALL body systems, & used for ALL body functions! In a sense, an acupuncture treatment ‘reminds’ the body how to function when it is healthy ~ moving easily & without pain, all of the systems working smoothly and efficiently, emotions are calm, steady, and happy, with quality sleep! Acupuncture establishes homeostasis, or balance, by reminding the body how everything is ‘supposed to work’ together; how the systems (endocrine, reproductive, immune, cardiovascular, digestive, metabolism…) function when they are healthy- without disease and illness, & pain free! ATP, the supercharged energy molecule in each of our cells, is the modern day equivalent of Qi, the energy described in Acupuncture & Chinese medicine. In other words, ATP needs to be made available or accessible for our body to use, in order to function properly. Acupuncture stimulates the smooth flow of qi, by triggering the release of ATP for us to use, as needed. This method is also referred to as “Purinergic Signalling”, due to the components of ATP, (adenenosine and 2 phosphates), being purines. These findings are credited to the work of neurobiologist & nobel prize winner, Geoffrey Burnstock, president of the Autonomic Neuroscience Center @ UCL Medical School, who coined the term “Purinergic Signalling”, discovered in the 1970’s. I have experienced relief from my awful pms and painful periods – and now, do not miss any more work days since my acupuncture treatments! Top quality healing is offered by Jennifer Schade, LMT, medical orthopedic massage therapist. REFRESH IN YOUR NEW YEAR! Gentle, effective, and safe treatments take place in a comfortable and professional environment, following a comprehensive consultation and treatment plan customized to meet your goals.